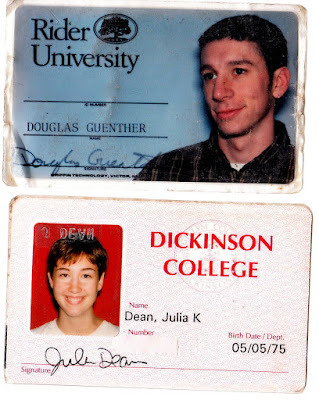 i came across our old college IDs - from 1993! 15 years ago. dont really feel like ive made a dent in this room! this is definitely a 2 weekend job. doug is at the office and should be home around 4ish. he's going to move some furniture around and then...make himself a birthday dinner. sounds sad, right? like im a bad wife? well, he wants to do it! he ENJOYS cooking! fun for him is = choose recipie, make delicious meal, big old mess and relax. and i provide the dessert. oh speaking of that, better get on it quick! more procrastinating! yea!!!! dont have any baby news to report, other than he is twirling all around these days and i seriously feel like im doing a load of laundry in my uterus. whoa.